It sure looks like the newest east Pacific tropical depression has formed south of Mexico. 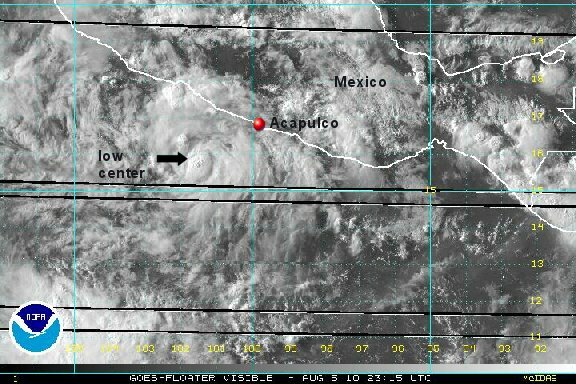 The massive ball of convection over the Gulf of Tehuantepec earlier today has drifted westward. The latest visible satellite imagery shows a well defined low level circulation on the eastern edge of the convection. 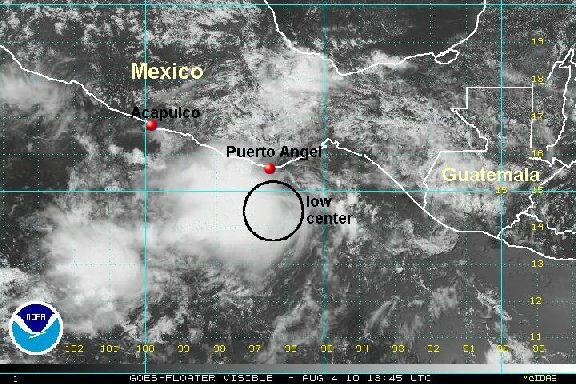 As of 4:00 pm edt / 1:00 pm pdt the tropical disturbance was centered near 14.5°N / 96.5 °W or about 80 miles south of the Puerto Angel, Mexico. Movement is to the west northwest at about 10 mph. Top sustatined winds are estimated at 30 mph. the latest forecasts take this tropical system parallel of the Mexico coast and offshore by about 100 miles. There are potential effects of wind, rain and high surf on the Mexico coast the next several days. A large burst of convection is moving up along the western coast of Mexico. This huge burst is actually ahead of a developing surface low. The low itself has limited convection, but enough to be classified as a depression IMO. As of 8:00 am edt / 5:00 am pdt the tropical disturbance was centered near 15.0°N / 99.5 °W or about 120 miles south southeast of Acapulco, Mexico. Movement is to the west northwest at about 15 mph. Top sustatined winds are estimated at 30 mph. Forecasts take this tropical system parallel of the Mexico coast and offshore by about 100 miles. There are potential effects of wind, rain and high surf on the Mexico coast the next several days. No change. The low is easily seen spinning off of the coast with convection associated with the circulation. We're not really sure why this hasn't been classified as the next tropical depression. As of 8:00 pm edt / 5:00 pm pdt the tropical disturbance was centered near 15.8°N / 101.5 °W or about 135 miles southwest of Acapulco, Mexico. Movement is to the west northwest at about 12 mph. Top sustatined winds are estimated at 30 mph. NHC classified 7E last night. It looks now to have reached tropical storm strength and should be upgraded shortly. It continues offshore with heavy rain near the coast. 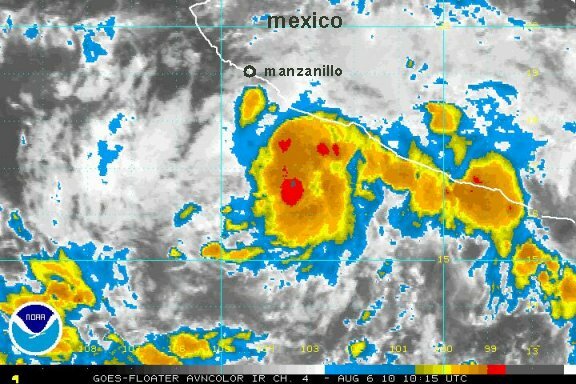 As of 7:00 am edt / 4:00 am pdt 7E was centered near 16.4°N / 103.3 °W or about 195 miles south southeast of Manzanillo, Mexico. Movement is to the west northwest at about 10 mph. Top sustatined winds are estimated at 40 mph (NHC 35 mph). Forecasts take this tropical system parallel of the Mexico coast and south of the Baja. There are potential effects of rain and high surf on the Mexico coast and southern Baja over the next couple of days. The structure of Estelle has improved and further strengthening is likely as it pulls away from the west coast. It will pass to the south of Cabo San Lucas with most of its effects. 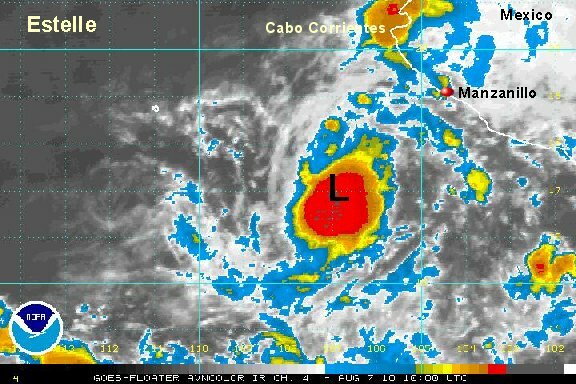 As of 5:00 pm edt / 2:00 pm pdt tropical storm was centered near 17.2°N / 105.0 ° W or about 225 miles south Cabo Corrientes, Mexico. Movement is to the west northwest at about 12 mph. Top sustatined winds are estimated at 45 mph (NHC 40 mph). Forecasts take this tropical system south of the Baja over the next few days. There are potential effects of rain and high surf on the Mexico coast and southern Baja over the next couple of days. Estelle weakened some overnight and has regained some strength. Overall, little change in intensity since yesterday. 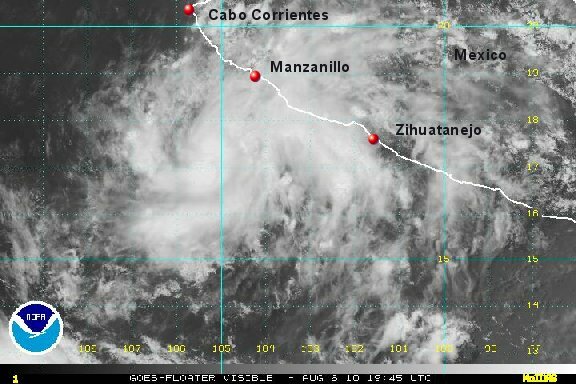 Estelle's effects on western Mexico are decreasing at it moves away from the mainland today. Some rain and higher than normal surf continue. As of 7:00 am edt / 4:00 am pdt tropical storm Estelle was centered near 17.0°N / 106.8 ° W or about 460 miles south southeast of Cabo San Lucas, Mexico. Movement is to the west at about 10 mph. Top sustatined winds are estimated at 45 mph (NHC 50 mph). 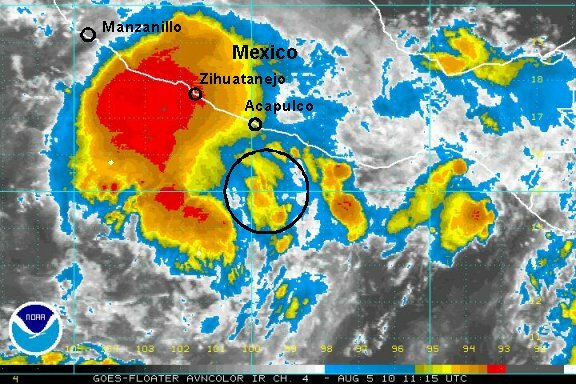 Estelle is a small tropical storm heading slowly away from western Mexico. It is also south of Cabo San Lucas with Cabo not experiencing any effects from it. 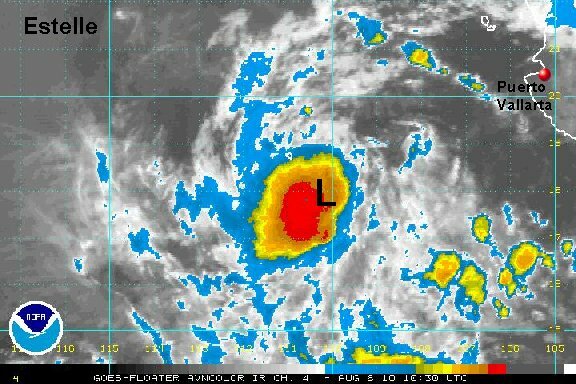 The low center is displaced slightly to the northeastern side of the convection. Estelle will start losing strength as it gets over cooler water. As of 7:00 am edt / 4:00 am pdt tropical storm Estelle was centered near 17.9°N / 110.4 ° W or about 345 miles south southeast of Cabo San Lucas, Mexico. Movement is to the west at about 10 mph. Top sustatined winds are estimated at 60 mph (NHC 65 mph). Forecasts take Estelle slowly west, south of the Baja over the next few days. There will be little additional effects from Estelle except for some higher than normal surf on the west central coast of Mexico. This will be our last update on Estelle as it is is having little effect on Mexico and continues to move out to sea. We will restart updates if Estelle poses any addtional problems in the future. NHC dropped winds to 60 mph on the last advisory to agree with our previous assessment.